xChips are a rapid electronics development ecosystem to help reduce development time and simplify making custom products as well as aiding learning. Without soldering, wiring, breadboarding, or hardware knowledge you can assemble a circuit in minutes, and concentrate on coding. xChips are compatible with the platform you want to use and bridges are available for the most popular pltatforms; Raspberry Pi, Minnowboard, Beaglebone, Micro:bit, Pixhawk and 96 boards. Rather than bridging to Ardunio, we offer compatible cores for Arduino Uno, the CC01, and for Arduino Zero, the CC03. xChips utilise I2C, and due to this bus architecture, unlimited expansion of circuits is possible. Limitations of I2C addresses have been negated by development multiplexers. xChips connect to each other using an xBus connector, available from RS 174-4977. Some xChips need an xPDI connector (RS 174-4974) to connect to programming interfaces, such as the IP02 or IP03. This xChip is an output control module, based on the PCA9554A by Texas Instruments, which is an 8-bit I/O expander for the two-line bidirectional bus (I²C). 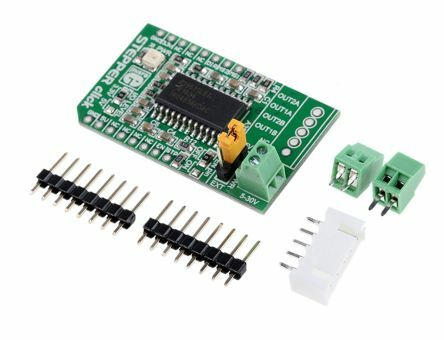 On this xChip, the PCA9554A drives the control signals of a DRV8825 Stepper Motor Controller. 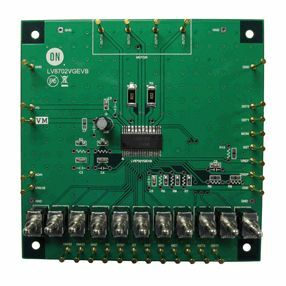 The PCA9554A accepts control commands through the I²C interface which provide the control signals to the DRV8825. The DRV8825 provides an integrated motor driver solution for printers, scanners, and other automated equipment applications. 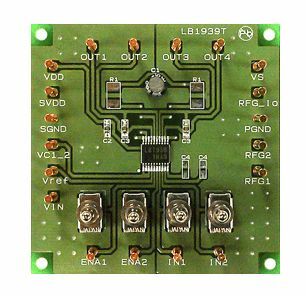 The OC06 has one H-bridge driver and a microstepping indexer, and is intended to drive a bipolar stepper motor. 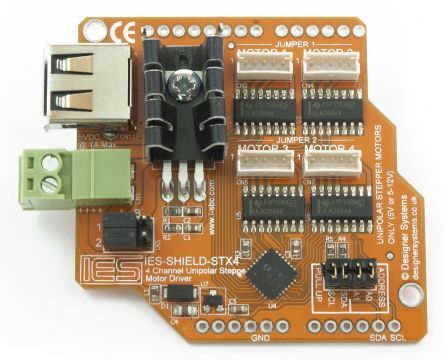 This xChip is capable of driving an individual stepper motor only. When more than one stepper motor is required, the physical address of the PCA9554A can be changed by soldering the I²C address selection pads.